President Recep Tayyip Erdoğan called on countries worldwide to extradite the Gülenist Terror Group (FETÖ) members and said that those countries will receive similar treatment if they refuse to extradite FETÖ affiliates. "Fighting terrorism is not a local matter," Erdoğan emphasized during his address to the ruling Justice and Development Party (AK Party) deputies at a weekly parliamentary group meeting, returning as party chairman after 1044 days of hiatus, reminding all countries that counter terrorism is the implementation of an international agreement and urged all countries harboring FETÖ suspects accused of perpetrating the July 15 failed coup attempt to extradite them to Turkey. Tuesday's AK Party parliamentary group meeting began with the opening remarks of Prime Minister Binali Yıldırım, who assumed the role of the party's parliamentary group chairman after Erdoğan was re-elected party chairman on May 21. 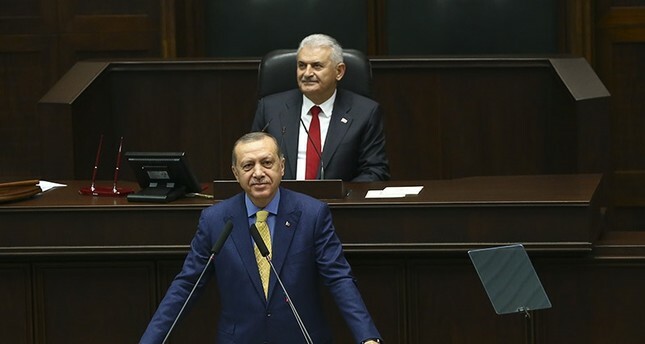 Yıldırım stated in his remarks that the new era after April 16 is to be a reform era in which he also said the new presidential system of governing is to be fully implemented after 2019 elections. Before introducing President Erdoğan who was to speak, Prime Minister Yıldırım said that the party had missed him. As Erdoğan walked up to the stand, long chants and clapping continued while a group of the party's provincial organization began singing for the party chairman and President. Touching upon Turkey's counterterrorism operations, President Erdoğan stressed that "counter terrorism is not a local matter." Underlining that those countries worldwide must extradite the followers of FETÖ; Erdoğan said "I now call on the world that if you do not contribute to the restoration of honor [of those victims from July 15 coup], you should know that you will not receive anyone that is captured by us. Because counter terrorism is not local, it is the implementation of an international agreement. If such international combat is being conducted, then we want you [other countries] to extradite those [Gülenists] immediately, as we will also deprive them of their citizenships." President Erdoğan also affirmed that if not extradited by those countries, then similar treatment is to be applied by Turkey. Erdoğan continued on his remarks by announcing that the AK Party had begun a new project aiming at the year 2035, as he said "it will establish the fundamentals of our 2053 vision of which our youth will be the guardianship." Erdoğan further stated that he asked for all ministers to prepare a 180-day short-term action plan initially regarding the problems voiced by citizens. "Similarly to our 100-days of immediate action plan we introduced when we first came to power, this [180-days] program will establish immediate solutions to the accumulated problems of our citizens and these works will continue until 2019 elections," he noted. Additionally, Erdoğan repetitively emphasized the unity of the nation and once more affirmed that "our primary goal is to win the hearts of our 80 million citizens," as he also described the AK Party as "democrat, republican, domestic, national. That is why the AK Party is inclusive." Meanwhile, addressing the Central Decision and Executive Board (MKYK) and the newly designated Central Executive Board (MYK) on Monday at the fast-breaking (iftar) dinner at the AK Party headquarters in Ankara, President Erdoğan also said "The secret to the AK Party's stay in power for a period of nearly 15 years lies in its ability to constantly rejuvenate itself." Stressing that Turkey has gone through in the past three years what many other nations haven't experienced in a quarter or half century, President Erdoğan said, "We are obliged to swiftly prepare and implement a program that will ease the burden on our nation, from whom we have asked many sacrifices one after another. Toward this end, we will introduce a 180-day action plan in the first stage and then a more detailed one covering the period to 2019. We will quickly and resolutely put into action these works, which are kind of a rehearsal for our goals for 2023. It is a must for us to make the best use of this period so as to stand strong in the face of challenges during the ongoing global restructuring process, at the center of which is our region."